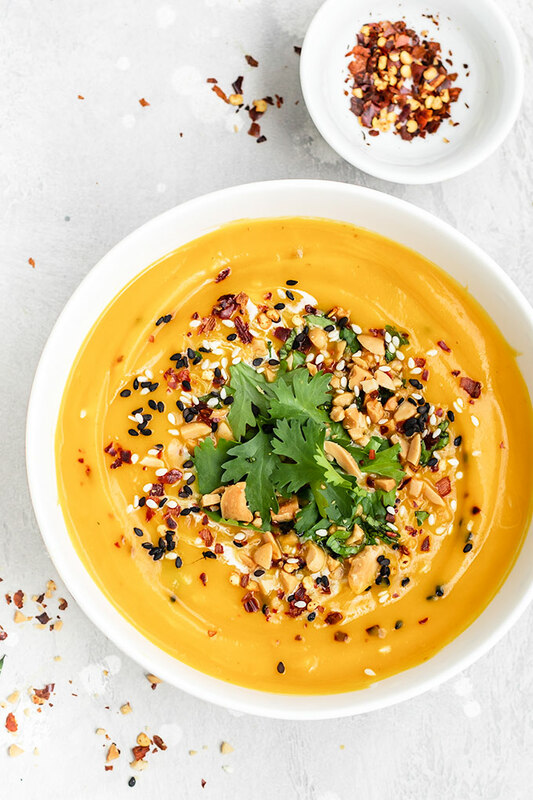 This spicy Thai Butternut Squash Soup is sure to warm you up on a cold day! 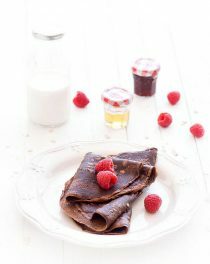 It’s creamy, velvety smooth, filling, super healthy, and SO delicious! 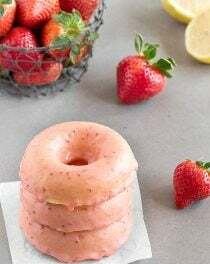 Plus it’s naturally gluten-free and vegan. For those days when you’re craving a cozy, comforting bowl of soup, I have the perfect recipe for you. 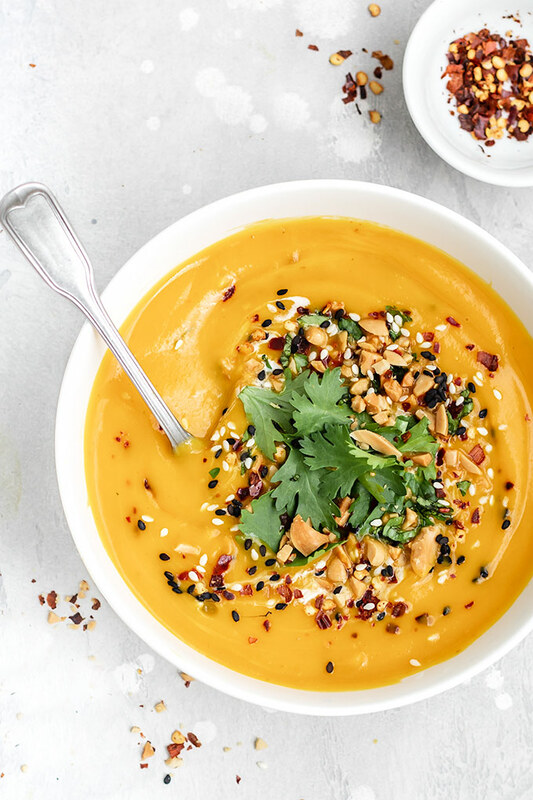 This Thai-inspired soup has just the right balance of sweetness and spicy flavors, and it tastes like something you simmered on the stove all day long. 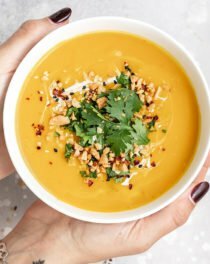 How do you make Thai butternut squash soup? Red curry paste – it can vary in spiciness depending on the brand you use. Start with 1 tbsp and add more to your desired taste. Start by roasting the squash until tender and slightly browned in spots. Roasting the butternut squash brings out the sweetness + you don’t need to peel and cut it into chunks. Just halve, roast, then scoop out the flesh. Easy! You can even roast the butternut squash ahead of time, let it cool, then scoop out the flesh into a bowl and refrigerate. Sauté the onions, garlic, ginger. Stir in the roasted butternut squash + the remaining ingredients. Bring to a boil then reduce the heat to medium-low, cover and simmer for 15 minutes. Use an immersion blender or a traditional blender to puree the soup until smooth. Just be extremely careful blending hot liquids; you do not want the blender to be too full. Taste and add extra salt and/or cayenne if needed. Add a splash of coconut milk on top of each bowl to swirl in. Nuts and seeds: crushed peanuts, roasted almonds, pine nuts, pumpkin seeds, cashew nuts, black and/or white sesame seeds. Chopped cilantro, lime wedges, red pepper flakes, pomegranate arils. 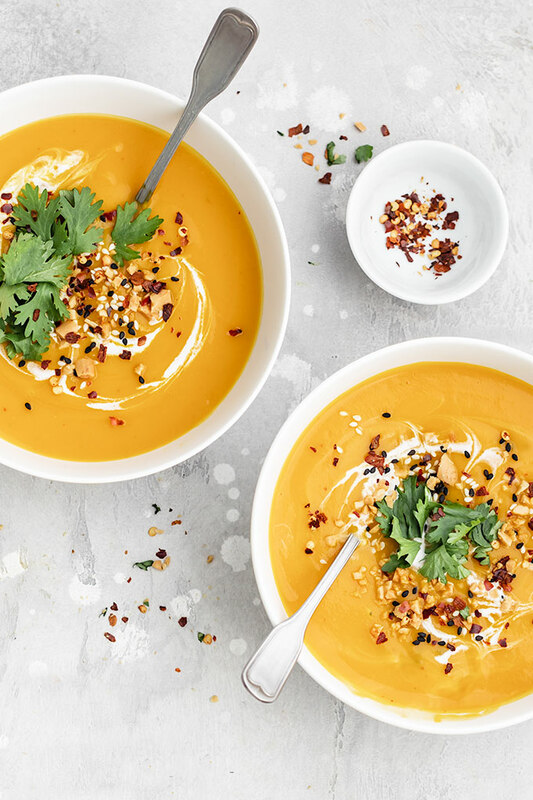 Make the soup with raw butternut squash. Peel the squash, remove the seeds, and chop it into chunks. Add the butternut squash at the same time as you add the vegetable stock. Replace the butternut squash with pumpkin, sweet potatoes and/or carrots. Add some rice, quinoa, or farro. 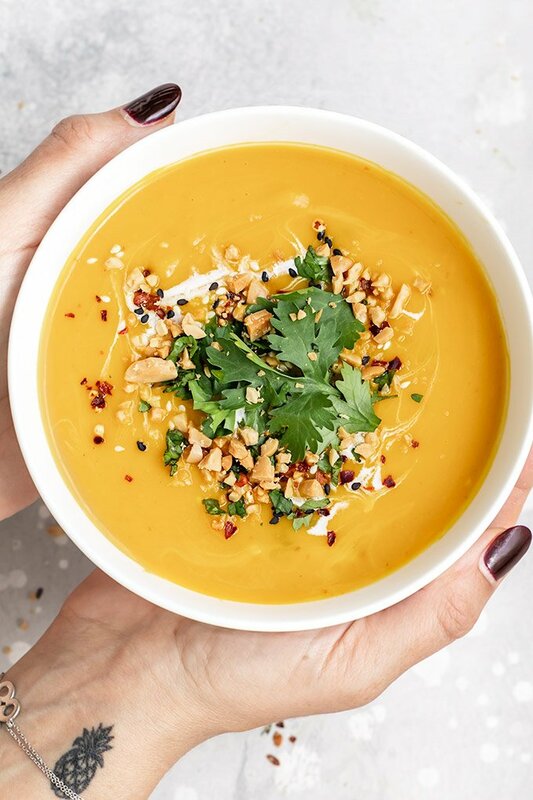 Roasted butternut squash soup can be stored in the fridge for up to a week. 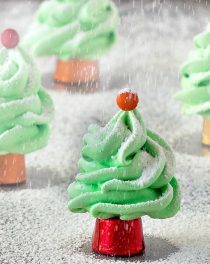 If you have leftovers, it also freezes well for up to 3 months. 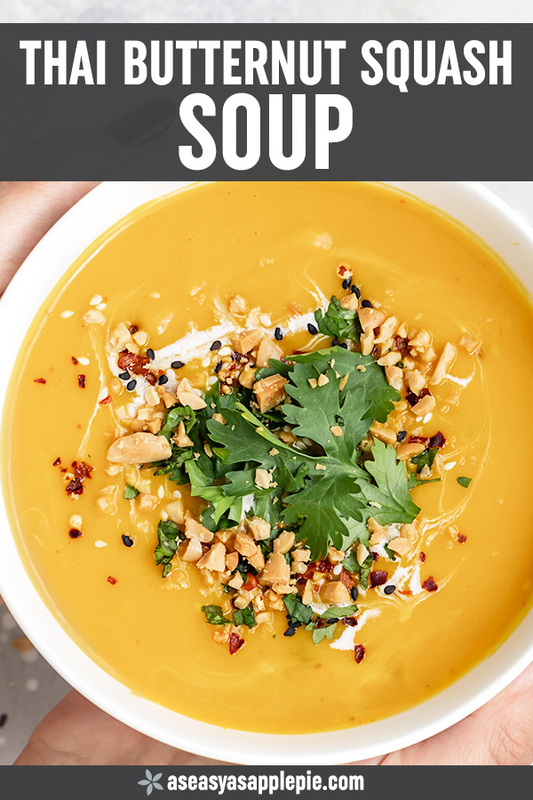 This soup with some cashews, I want it!! Can’t wait to make it at home.